What does it mean to have your ducks in a row? For most of us, it means being well-prepared and organized in advance. Personally, I am a little scatter-brained and disorganized, so it is not a term that I would apply to myself very often. As is the case with many such expressions, it is sometimes fun to apply them literally. 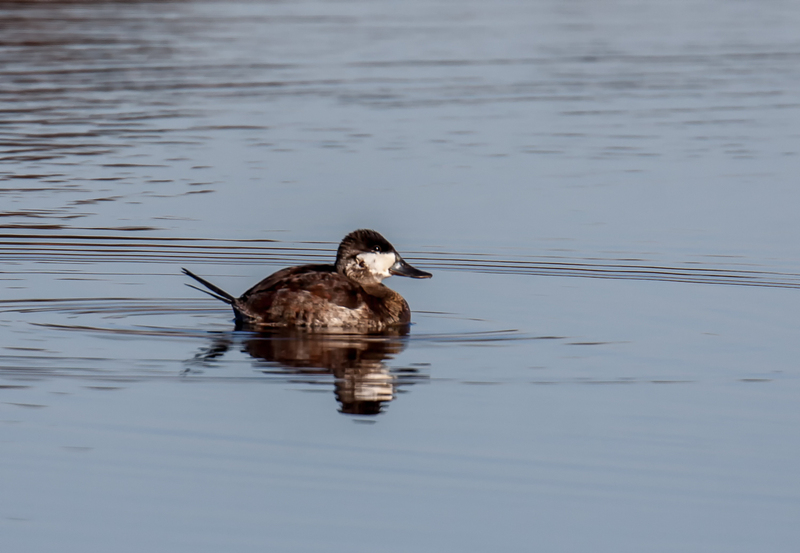 Last week I spotted some Ruddy Ducks (Oxyura jamaicensis) in the waters off of Occoquan Bay National Wildlife Refuge. The wind was blowing pretty hard and the ducks seemed to be struggling to stay together. From my perspective, they seemed to be ducks in a row, though from their perspective, they probably felt like they were ducks in a column. It’s all a matter of perspective. Most of the time that I see Ruddy Ducks, they are in groups like the one in the first photo, usually in the deeper waters. For more than a month, though, I have been seeing a solitary male Ruddy Duck in the more placid waters of a small pond at the wildlife refuge. I captured him in the second image below on the same day as the first shot. In both of the photos, you can see the stiff tail that is one of the distinguishing characteristics of this species. I often wonder about the origins of expressions like “ducks in a row.” I assumed that it had to do with a mother duck and her ducklings, but decided to search the internet to see if that was the case. I came across a wonderful posting by The Word Detective that addresses speculation that the expression comes from the game of pool. It is a fun read, particularly the comments from readers suggesting that the expression is related to ship or aircraft construction or to duck hunting. Nice Mike! Rudy ducks are fun to photograph! Thanks, Reed. I am hoping during the upcoming months to be able to get some better shots of them. My unusual cycle is to be excited at getting initial shots and then to work hard to get even better ones the next time I see the subject. Hi Mike, I use this expression quite often…It is usually when “I don’t have my ducks in a row…” Lol! 😃 Great photos!! 🦆🦆🦆 I have never seen this duck before.